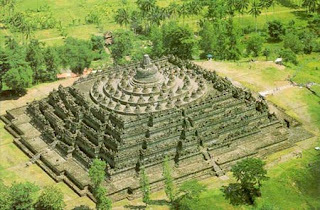 Borobudur is one of the best in the world heritage by UNESCO and is recorded in the List of World Heritage (World Wonder Heritages). That said, this temple was buried by the eruption of Mount Merapi (950 M) and only rediscovered in the 19th century by Governor General Sir Thomas Raffles (1814). Borobudur Temple punden shaped staircase, which consists of six levels of a square. 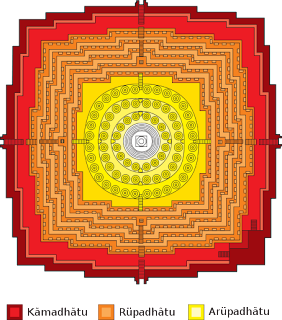 Three levels of a circular and a main stupa as a peak. The temple which is one of the seven wonders of the world was built by King dynasty in VIII century AD. 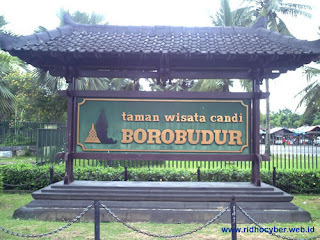 The word comes from coal and Borobudur budur. Bara / monastery means temple and budur or beduhur means above or hill. So, could be interpreted as Borobudur Temple Complex located on the hill. Building height reached 34.5 m The building of the temple-shaped tiers. Getting up the smaller, pyramid-like building. Levels 1 to 6 square and level 7 to 10 circular. 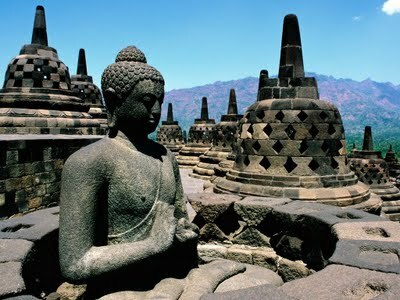 In 1460 there Borobudur temple reliefs and statues of Buddhas and stupas as many as 504 pieces of fruit 72. When viewed from above, the Borobudur Temple looks like a lotus flower. The temple consists of 10 levels has stories of Buddha carved on walls throughout. Each terrace has beautiful relief panels showing how skillful. Cluster of relief it will be read coherently when visitors walk clockwise (towards the left of the entrance of the temple). In the reliefs, Borobudur tells of a legendary story, the Ramayana. In addition, there are relief panels describing the condition of society at that time. For example, relief of farmers' activity reflecting the advance of agriculture system and relief of sailing boat representing the advance of the shipping time was centered in Bergotta (Semarang). In addition to being the highest symbol of Buddhism, stupas of Borobudur is a replica of the universe. 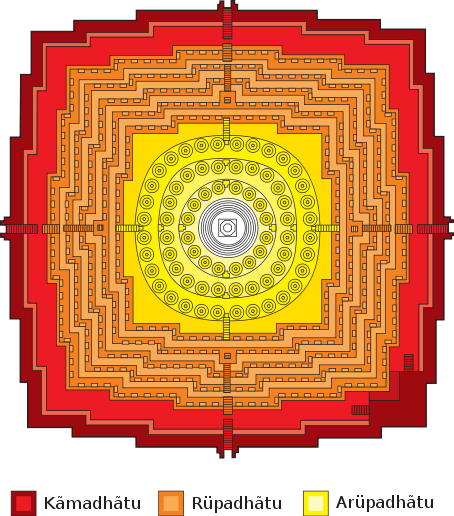 It symbolizes the micro-cosmos, which is divided into 3 levels. The first level is the human world where the desire is still influenced by negative impulses. The second level, a world where humans have been able to control the urge to use negative and positive encouragement. And the highest level, where the man is no longer dominated by worldly desires. With all the charm and mystery, only natural that many people from all over the world enter the Borobudur as a place to visit in his life. Besides enjoying the temple, visitors can walk around to the villages around Borobudur, such Karanganyar and Wanurejo to see the activities of local crafts makers. Visitors can also go to the top of Watu Kendil to be able to see panoramic view from the top of Borobudur. So, what are you waiting? Temple site approximately 100 miles southwest of Semarang and 40 km northwest of Yogyakarta. If the direction of Semarang, visitors can ride the bus majors Semarang-Yogyakarta and Magelang off at the bus station and takes about 2.5 to 3 hours. From the bus terminal Magelang, the trip can be continued using the minibus Borobudur majors at a cost of about Rp. 5000.00 (April 2008). Meanwhile, if taken from the direction of Yogyakarta, the trip takes approximately 1 hour by public transport or private vehicles. Until on-site parking, travel about 15 minutes still to be reached by walking through the flower garden and stairs. Entrance is distinguished between local tourists with foreign tourists. For the local tourist entrance fee of Rp. 9000.00 for adults, and RP. 5000.00 for the kids. As for foreign tourists Rp. 99000.00 for adults and Rp. 54000.00 for children. As one of the famous tourist destination in the world, Borobudur temple complex provides facilities / accommodation are quite complete, such as hotels / lodging houses, restaurants / restaurants, souvenir shops, telecom shops as well. 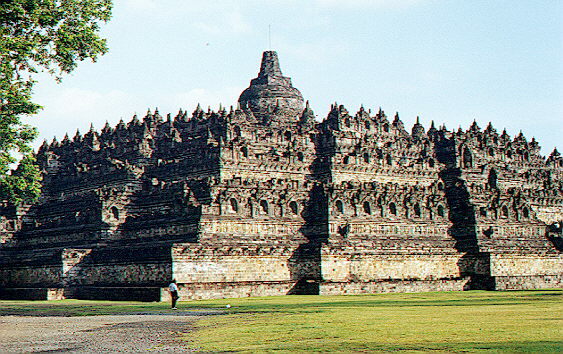 In addition, the existence of labor guide / tour guides are easy to find around the Temple will make the trip becomes more complete, because visitors will be guided to explore information related to the historical, cultural and architectural significance of the Borobudur Temple.